The Jayhawks are dancing into their 28th straight tournament appearance. It also marks the 13th time the program earned a No. 1 seed. Their regular season success highlighted by a 28-4 record was slightly marred by Josh Jackson’s suspension in the Big 12 tournament and quarterfinal loss to TCU. Jackson and Frank Mason Jr. account for 37 points, 11 rebounds, eight assists and three steals per game. In 1,001 simulations of the NCAA Tournament, Kansas cuts down the nets eight percent of the time, trailing only UCLA, Villanova and North Carolina for the best championship odds. The Jayhawks are the most likely team to emerge out of the Midwest Region with their 30.7 percent chance of beating out Louisville (16.1 percent). Louisville’s six conference losses and eight overall may look ugly on the resume. However, the Cardinals’ leveraged the seventh-highest RPI and second toughest schedule in the country to earn the No. 2 seed in the Midwest. Rick Pitino’s squad also ranks third in the nation in the statistically-friendly defensive efficiency category. 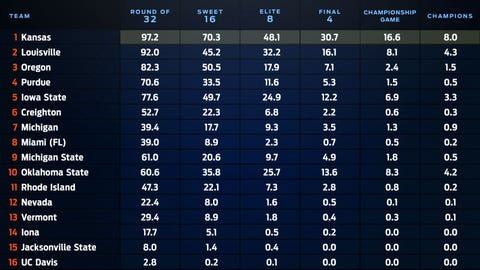 In WhatIfSports.com’s simulation of the tournament field, the Cardinals reached the Sweet 16, 45.2 percent of the time and advanced to the Elite Eight in 32.2 percent of simulations. Louisville’s Final Four odds are 16.1 percent, which ranks eighth among all 68 tournament teams. However, the Cardinals have the best odds to win it all among No. 2 seeds – 4.3 percent. Oregon just lost one of their block shot specialists in 6-foot-10 Chris Boucher due to a torn ACL suffered in the Pac-12 Tournament. The senior big man averaged 24 minutes, 12 points, six rebounds, and better than two block shots per game. It’s a glaring gap, which could stunt the Ducks’ tournament run. Oregon is the only No. 3 seed in the simulation with less than a 10 percent chance at reaching the Final Four. The good news is they are a coin-flip favorite to reach the Sweet 16. They may have won the Big Ten regular season title, but Purdue’s early-exit from the conference tournament – courtesy of Michigan – leaves them an unappealing No. 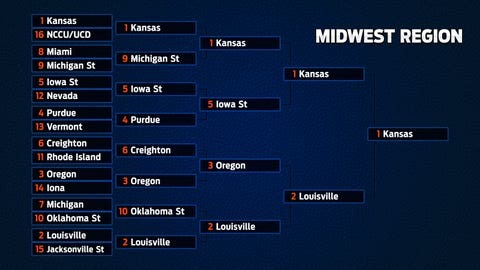 4 seed in the Midwest. The Boilermakers boasts four double-digit scorers led by Caleb Swanigan and his 18 points and 12 rebounds per game. It’s also worth noting, Purdue ranks third in the country in assists per game (18.2), which supports strong ball movement when college basketball can become static on offense. If you followed the Big Ten in 2016-17, it should come as no surprise that Purdue has the worst odds of N0. 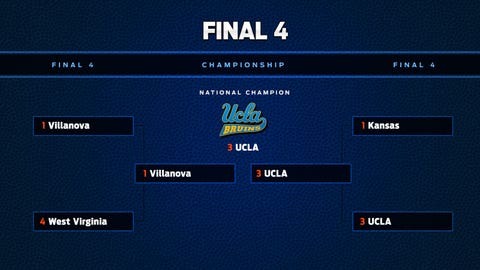 4 seeds to reach the Final Four. In fact, three No. 10 seeds and a No. 11 seed have better odds. The silver lining is the squad has a 33 percent chance of reaching the Sweet 16.